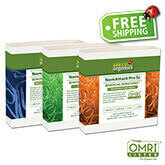 ARBICO Organics is proud to offer our new line of OMRI Listed Beneficial Nematodes! We carry the same three species that we always have: H. bacteriophora, S. feltiae and S. carpocapsae. 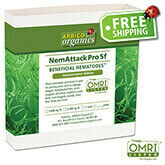 The PRO Beneficial Nematodes are listed for organic use and can be used anywhere that chemical-free control of soil-dwelling pests is desired. For more information about species selection, refer to our Beneficial Nematodes Selection Chart. Please be aware that the certified status of a product can change at any time without notification from the manufacturer or OMRI. Although we make every attempt to assure that the status of the products listed as certified organic are current and up-to-date, when purchasing a product we advise you to protect your certification by checking with your certifying agency that it is acceptable. Click Here for non-OMRI listed nematodes.